On 10 July 2014, after accumulating the required quantity for his PMS, Porinju Veliyath published the research report on Force Motors. The report showcased the cheap valuations of Force Motors at the price of Rs.475 and potential upside it can have in the near future. 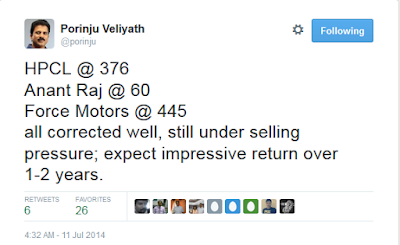 Also on July 11, he tweeted that Force Motors is a compelling by at then price of Rs. 445. Force Motors is a fully integrated automobile company, with expertise in design, development and manufacture of vehicles and the full spectrum of automotive components thanks to collaborations with leading global auto companies like Daimler , ZF, Bosch and MAN over the last five decades. Pioneer of the Light Commercial Vehicle (LCV) Industry in India that delivered iconic brands like the Tempo, Matador, Minidor and Traveller enjoying over 50% market share in the segment. Range includes Small Commercial Vehicles, Multi-Utility Vehicles (MUV),Light Commercial Vehicles (LCV), Sports Utility Vehicles SUV) and Agricultural Tractors. Forayed into the passenger vehicle segment in 2011 withthe Force One SUV which was met with muted response. The company is expanding its presence in this segment with the Force Gurkha, a niche off-road vehicle which is expected to be launched soon. The company has a long standing relationship with Mercedes-Benz and assembles engines and other aggregates for the entire range of Mercedes luxury cars assembled here.Mercedes is aggressively expanding its Indian product portfolio with the launch of more volume products and Force stands to be a big gainer. The company has plants in Pune and Madhya Pradesh and has proposed setting up a manufacturing facility in Tamil Nadu by early next year to manufacture and assemble engine-gearbox for BMW. Association with Global majors such as Mercedes and BMW is testament to the high standards of quality the company adheres to. In FY14, the company clocked revenues ofRs 2100 cr and net profit of Rs 80 cr. The company is debt free and asset rich with Rs 220 cr cash on the balance sheet and significant landholdings.At Rs 630 cr market cap, itis trading at nearly half its Book-Value! Investors’ perception of the management has taken a beating,because of the purchase of an aeroplane for Rs 140 crand paying Rs25 Cr for charity, while the dividend pay-outwas just Rs 4 Cr.We take it lightly as it looks like a one time hiccup! Bajaj holds 20% stake in the company and has been selling at the counter. Itis a good opportunity for investors to accumulate. Promoters increasing their stake and Bajaj exiting are positive triggers for shareholder wealth creation.Stock looks deep value at just 0.3 times revenue! Company has inaugurated a new plant near Chennai this month exclusively for assembling engines for BMW and has invested Rs 200 crore for the same. The new plant has capacity to assemble 20,000 engines per year. This is a very unique situation because there is no company currently in the world who is producing engines for both BMW and Mercedes. 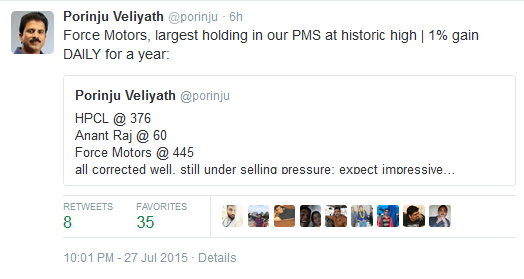 Next Eicher Motors in Making?? On July 24th, CA Rudramurthy BV at Vachana Investments gave a buy call by saying Force Motors is a company which has a return of equity close to 20-25 percent and return of investment close to 40 percent, a profit growth of about 40 percent which makes it a wonderful buy on valuations. He confirms that Force Motors is a stock which can further move up from current level and it is good to bet on the winning horses than on something which is not doing good. Recent numbers indicate the luxury car market in India has grown eight times over the last seven years. An estimated 33,000 units were sold in India in 2014 – a steep rise from just 4,000 units sold in 2007. The growth rate could continue for another seven years as the ranks of the nation's wealthy continue to swell. Also, experts believe that the luxury car sales could cross the 100,000 mark by 2020. If this growth figure can be achieved, then sky is the limit to Force Motors. Who knows Force Motors will be trading at 20K in 2020!!! Today, after one year, Force Motors closed at Rs. 2317 and Porinju Porinju Veliyath has tweeted proudly that Force Motors has the highest percentage of allocation in his PMS. He has just shared his happiness for having a 5 bagger in just one year time frame.